"I'm going to tell you the story of his two most unlikely, and totally unwitting, saviors. Two people who will very nearly destroy all of reality...well, maybe I shouldn't be throwing the word "people" around." One of the best things to come out of the 80s was the Teenage Mutant Ninja Turtles. Their unconventional origin story was cleverly leveraged throughout their universe, lading to the creation of plenty of other notable characters. 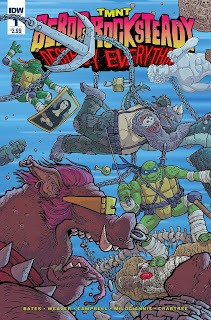 Two of the most notable were Bebop and Rocksteady, both of whom get the star treatment in TMNT Bebop & Rocksteady Destroy Everything #1 from IDW Publishing. The issue is written by Dustin Weaver, illustrated by Sophie Campbell, Weaver, Ben Bates, Giannis Milogiannis, colored by Bill Crabtree and Campbell and lettered by Shawn Lee. It's never easy to pull off a time-traveling tale, but that's not going to stop Weaver in TMNT Bebop & Rocksteady Destroy Everything #1. He does a great job of setting up the stakes for all involved, showing the Turtles in the present and then the titular Bebop and Rocksteady in both the present and past. Weaver's pacing helps both stories converge on one point effectively, giving readers a chance to get to know all the characters. The dialogue also maintains the spirit of the characters well, from Michelangelo's generally aloof (but humorous) comments to Bebop and Rocksteady's more gruff take on life. The overarching time-travel plot is also given time to evolve as well, with Weaver not rushing into things and instead letting the characters drive the narrative. The characters in question have a very distinct style and the art team capture that style perfectly. Each of the four artists manage to keep the art style pretty consistent throughout the entire issue. The Turtles sport the leaner look of more recent appearances and it works well when contrasting them against the mammoth Bebop and Rocksteady. And the pages showcasing the opponents fighting one another are very explosive and showcase the disparate fighting styles on both sides of the bout. Colors by Crabtree and Campbell are very clean and offer a somewhat muted look across the board. 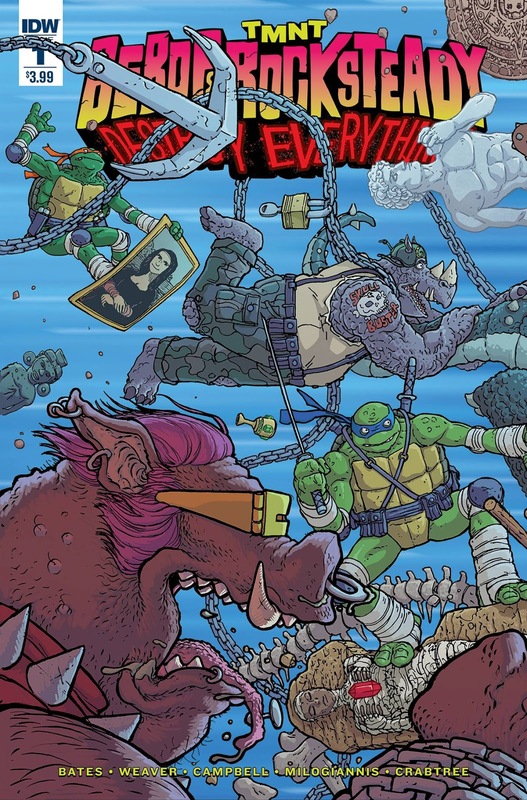 TMNT Bebop & Rocksteady Destroy Everything #1 is a really strong entry in the TMNT mythos that's looks like it's going to get pretty heady pretty quickly. Bebop and Rocksteady typically don't get much chance to shine on their own, but it looks like they'll have just that in this book. Weaver's script is entertaining and moves the characters along well. There's really four artists working on the book, but the overall quality doesn't suffer because of it. TMNT Bebop & Rocksteady Destroy Everything #1 is worth checking out for those looking to see Bebop and Rocksteady in a slightly new light that involves them traveling through time and space. TMNT Bebop & Rocksteady Destroy Everything #1 is in stores now.